In the early nineteenth century Salisbury Plain was the preserve of sheep, with an estimated 500,000 of the Wiltshire Horn breed alone grazing there. 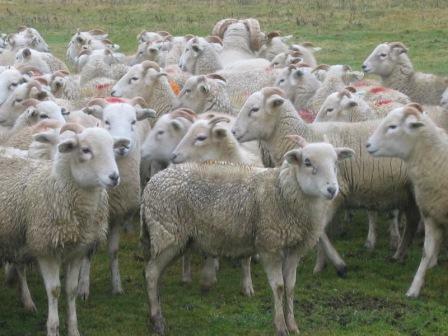 Gradually the wool industry went into decline and by 1850 most of the sheep had disappeared. Land prices became cheaper and with the Army out-growing the training areas around Aldershot the War Office began to buy land around the Salisbury Plain to create larger alternative areas. By the time of the start of the Boer War in 1899, the Army had acquired 40,000 acres. These newly acquired areas allowed the War Office to build ranges for the new rifle, the Lee Enfield, as well as allowing manoeuvres for the horse drawn artillery and cavalry. 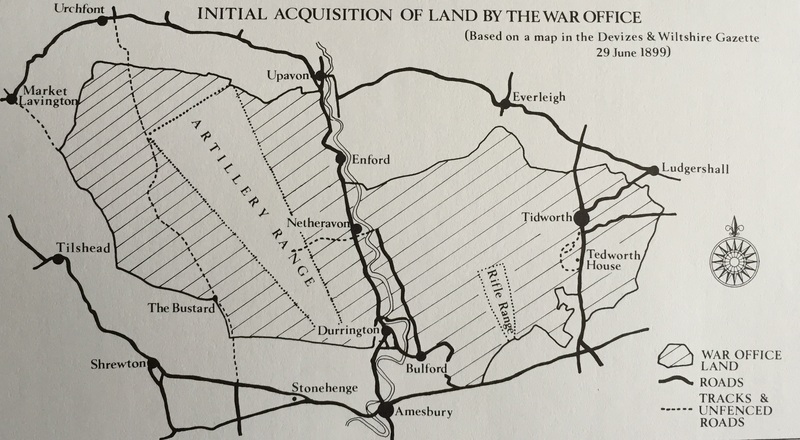 A map showing military land ownership on Salisbury Plain in 1899. The introduction of the large scale manoeuvres saw the arrival of the railway to bring in the troops and their equipment, which meant that towns like Ludgershall – that had been facing extinction with the demise of the wool industry – gained a new lease of life, as it became the railhead for troops arriving or departing the Salisbury Plain training area. 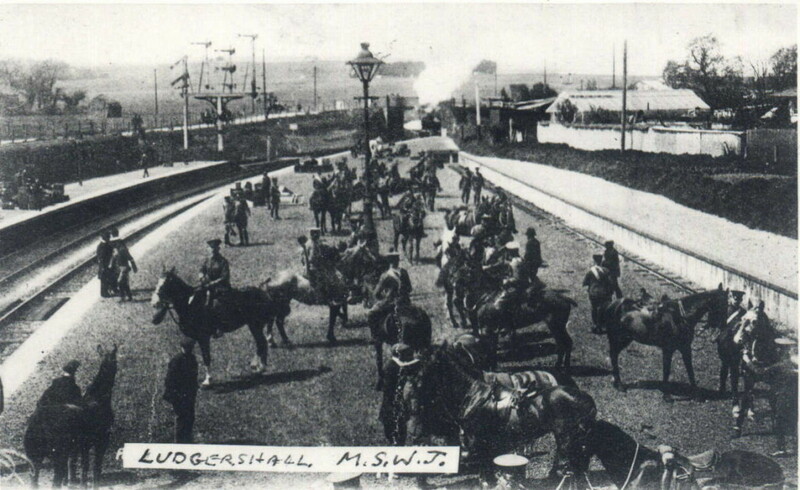 Ludgershall Station – a key strategic military place during WWI. With the outbreak of World War 1, Salisbury Plain underwent a massive transformation. Camps sprang up to accommodate firstly the Kitchener or Pals Battalions being raised in late 1914 and early 1915. As those battalions made their way to the fighting fronts – be that The Western Front in France, the Balkans including Gallipoli and Macedonia, the Middle East theatre of Palestine or Mesopotamia – the British troops on the Plain were replaced by Imperial troops from Australia, Canada, New Zealand and South Africa. 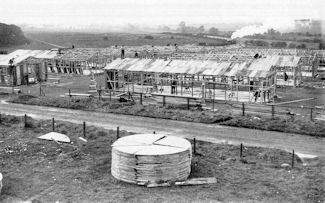 Later still in 1917 the Salisbury Plain Camps were used to house American troops before they deployed to the Western Front. 31 Camps were established in Wiltshire, 25 of them within the Salisbury Plain Training Areas. Each was like a mini-town. It provided shelter and storage of equipment and employed many Wiltshire civilians in support jobs, as well as military personnel. Tented accommodation, the accepted norm for the military at the outbreak of war, could not offer a permanent solution. So the Construction trade descended onto the Plain with their War Office contracts to build permanent camp structures. Whilst most of the contracts went to large national companies, the local firms of W. E. Chivers and F. Randel, both of Devizes, managed to gain contracts and had depots in Tidworth and Bulford. Throughout the war, they had more business than they could handle and employed many folk. Construction of Lark Hill Camp. 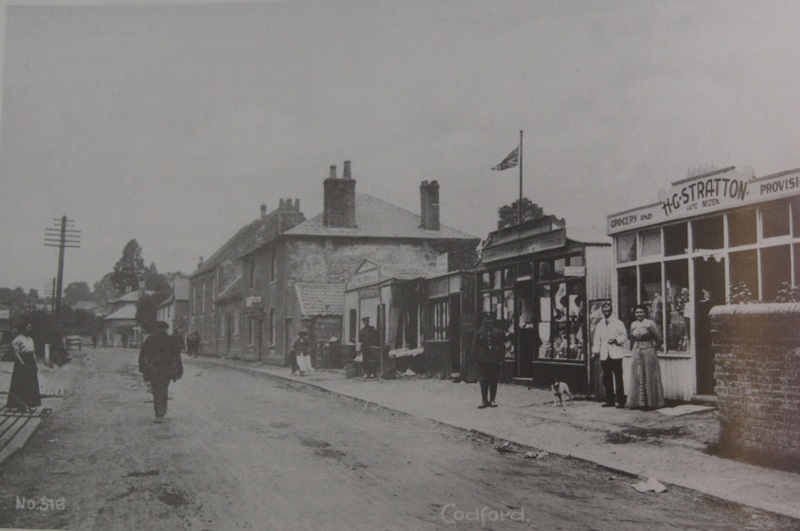 The village of Codford’s previous experience of troops was restricted to a temporary camping-ground during the 1872 manoeuvres, which must have been a novelty for the then 500 inhabitants. Just imagine the contrast for the villagers of Codford when 24,000 troops of Kitchener’s New Army came into the neighbourhood. Whilst the camps provided the troops with the basic accommodation and messing facilities soldiers complained of a lack of amenities. Such was the lack of off-camp facilities that it reported that one shop in Codford took £50 from Sales in one day (£50 in 1914 equates to £4,900 today). Another person commented that what the shop’s had been taking in pennies, before the war started, by October 1914 they were taking in £’s. Another story recalls a gypsy being seen ladling water from a steam into a container, adding some powder to the water and selling the resultant mixture as lemonade. Whilst the villagers of Codford did not necessarily have the acumen to run businesses themselves they did have assets that they could realise, their front room. Until such times as banks and shops could acquire their own property to run their business the villagers hired out their front rooms. These were eventually replaced by shanty buildings. Shack-shops in the centre of Codford village during WWI. The camps in and around Codford became the focal points for housing the Australian and New Zealand forces which has resulted in St Mary’s Church having the second largest Anzac War cemetery in the United Kingdom. Every year Anzac Day (25th April) a ceremony is still held in the church with attendance from the High Commissioners of Australia and New Zealand. In spite of Kitchener’s campaign to raise a new Army, there were occupations that were considered so vital to the War effort that these jobs were designated as ‘Reserved Occupations’ and thus exempted from the call up. One such individual in a ‘Reserved Occupation’ was Henry William Blagdon, a farm labourer from the area of Longbridge Deverill. In Spring he was involved with the Lambing, Summer was dedicated to Haymaking whilst Late Summer and Autumn meant harvesting the corn. Henry did not get much spare time and what he got he spent mainly in his garden like most of the villages producing vegetables and fruit for the War Effort. Henry was a self-taught musician who could read music. 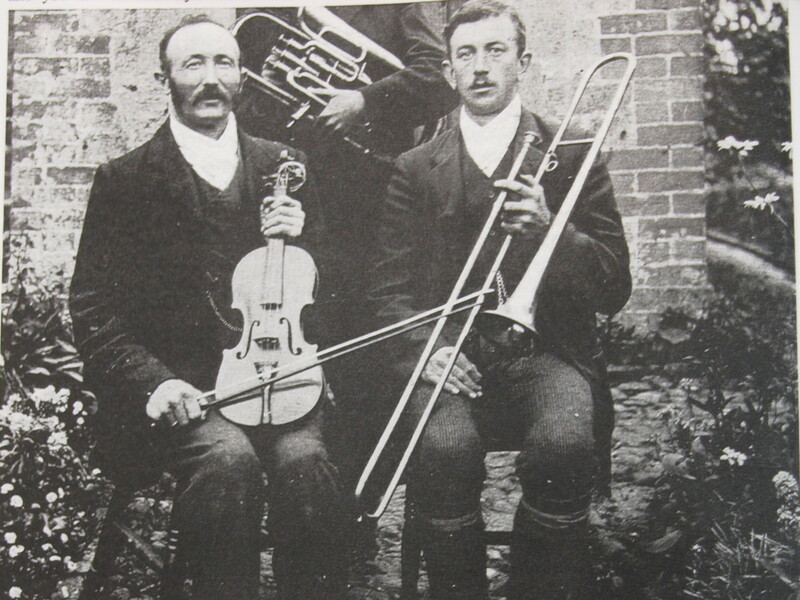 He played the trombone in the Heytesbury Band and when the instrument was not being used it hung from a beam in the Kitchen. Such was the need for skilled farm labourers that there are accounts of men fighting in the war zone being sent home to harvest the crops or plough the ground for the next season’s crop and once their job was done they returned to the war zone. War brought great opportunities for the business minded. A Salisbury entrepreneur established his cinema chain for the troops’ relaxation and entertainment. Sutton Veny folklore has it that one of the three cinema housed in the Quarry near the junction of Five Ash Lane and the Deverill Road came to a sticky end : It was managed by a husband and wife. The wife was reputed to a rotund lady whilst her husband was a slight person. One evening the projector broke down and the wife told her husband to take the money and disappear. Being an obedient husband he did as she told him and she told the troops she could not find him and was therefore unable to refund them. This was not good news as some of the lads were off to France the next day. When she persisted they set fire to the place and dragged the piano out, sang songs ending with “Keep the Home Fires Burning”. Then they threw the piano on the fire and departed. The construction of these permanent camps meant that construction material, military stores and equipment had to be brought in by rail and in many cases this meant the construction of specific lines. 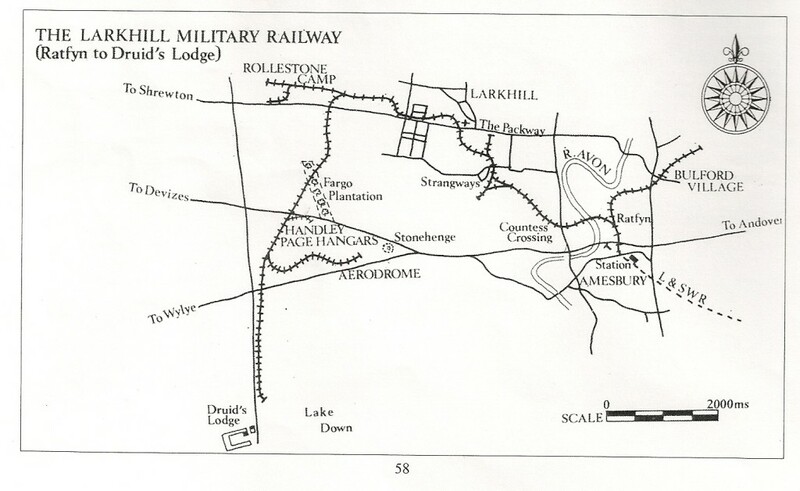 One such line was the Larkhill Military Railway (LMR).The map below shows the extent of the LMR, which was the longest railway to operate on Salisbury Plain, some 10 and three-quarter miles. The LMR branched off from the Amesbury –Bulford line at the Ratfyn junction. It branched off to air plane hangars very close to the ancient monument of Stonehenge. The Lark Hill Military Railway. The Larkhill Military Railway was operated by a small company of Royal Engineers of the Railway Operating Division (ROD). In addition to Larkhill there were similar lines at Fovant, Porton, Sutton Veny and Codford. One of the more spectacular items of military hardware associated with the Larkhill Military Line was His Majesty’s Gun ‘Boche Buster’. 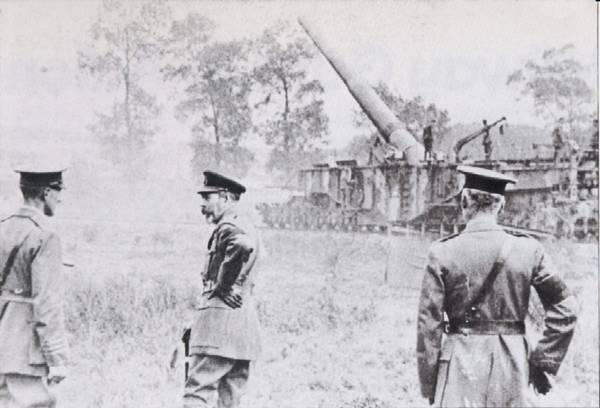 The huge 14inch rail mounted gun was eventually deployed for use in France against the Germans. The Larkhill Military Line was closed in 1924, but at least two elements of this line can be seen today. 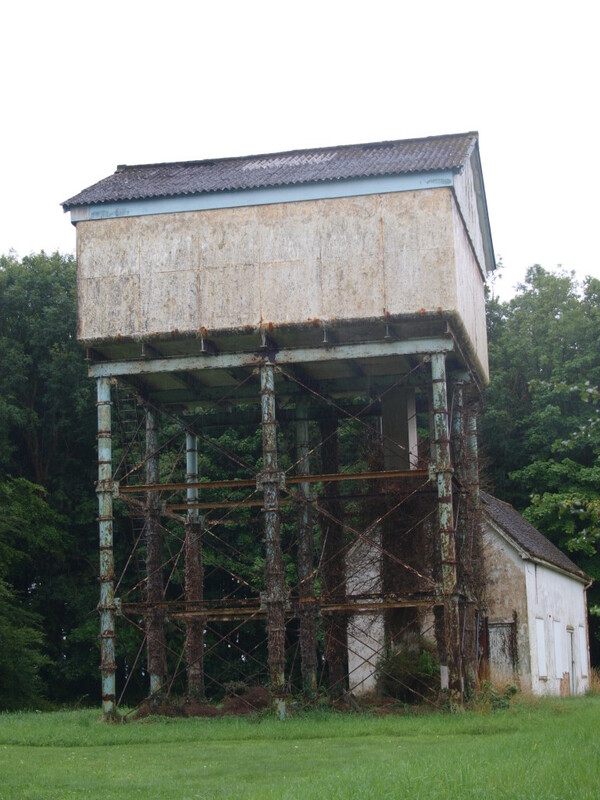 A derelict water tower, the remains of the end-of-the-line water collection point for the engines, stands opposite the Druid’s Farm Polo Fields on the A360 to Salisbury. Also, some of the railway lines from Rollestone Camp were used as kerbstones on the main road passing through Shrewton. 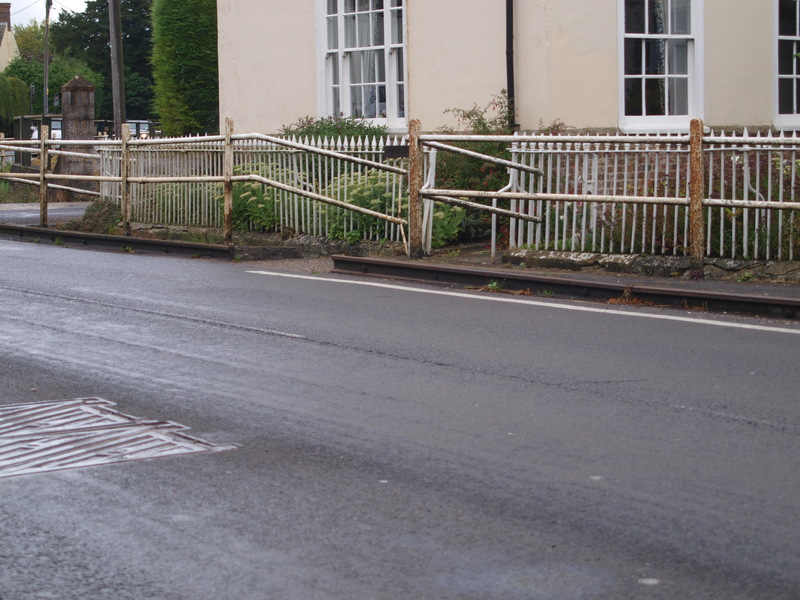 These unique kerbstones were allegedly added in the Second World War in an attempt to prevent American tanks, which passed through the village, mounting the kerb and ruining the pavement. The water tower on the A360 to Salisbury. The remains of the sleepers taken from the light railway in the village of Shrewton. Hi Malcolm, thanks for taking the time to comment. How interesting that your Grandfather George worked at the Wiltshire camps! It seems like you have quite a bit of information on him – would you care to share his story / experiences so we can look at posting them on the website? I’d love to see those photos and personal notes too! Malcolm – What regiment was he in? Curious, as I am from just outside Knighton (Llanfairwaterdine) and currently stationed in Tidworth.